This entry was posted in Bags and sachets, Classes, Tutorials. Bookmark the permalink. This is so very beautiful! Thank you! As with your stumpwork, the instructions are excellent. And of course your flowers are wonderful. Did you write a tutorial for them? This is a great turotial. Thanks for sharing, I appreciate all the work that went into making it. The .pdf format is a geat idea. 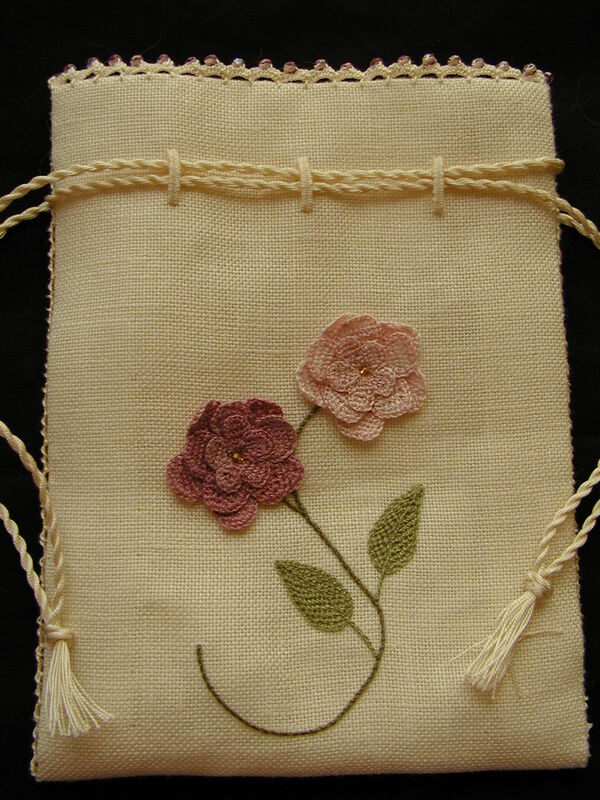 This is a beautiful piece – the needlelace flowers are gorgeous and the finishing instructions excellent. A great idea to put them on pdf. Any chance of instructions for the flowers? One f the most wonderful tutorial!!!!!!! Thanks so much: this treat bag is so cute! And the pdf format is great, because I can store it and have it forever! Thank you very much for this excellent tutorial!! and also for sharing your work. It’s superb! Thank you very much for this !!! thank you so much for this tutorial … I love the result !!! hi, my name it’s Ezia, i like your blog and i decited to give you an a award. this is my blog http://www.arthurezia.spaces.live.com. Great tutorial with wonderful close-up pictures for those of us who haven’t used those stitches extensively. This is a lovely bag! Thanks! Muy buen tutorial, perfectamente explicado.